The Ministry Road Transport & Highways in India has notified dual-fuel usage for agricultural and construction equipment vehicles in a bid to expand the use of natural and renewable gas. 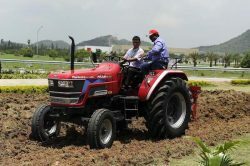 These include tractors, power tillers, construction equipment vehicles and combine harvesters which have originally been manufactured as dual-fuel with diesel as primary fuel and CNG or Bio-CNG (renewable natural gas) as secondary, or have been converted as such from in-use diesel vehicles. Rules 115A and 115 B of the Central Motor Vehicles Rules, 1989 have been amended to incorporate new rules 115 AA and 115 BB for the purpose. This move will give a boost to vehicles run on bio-fuel, and help in reducing both cost and pollution. According to the notification, emission norms for smoke and vapour from these dual-fuel vehicles will be same as the prevailing mass emission norms for the diesel mode. The mass emission standards for these CNG/ Bio CNG/ LNG dual-fuel engines of the agriculture tractors, power tillers, construction equipment vehicles and combine harvesters will be the same as the emission standards for the diesel engines of these vehicles with the exception that the HC (Hydrocarbon) shall be replaced by NMHC (Non-Methane Hydrocarbon) on measurement basis as detailed in rule 115 A. The tests for particulate matter and emission of visible pollutants (smoke) stipulated in the rule 115A will continue to be applicable for dual-fuel CNG or Bio-CNG or LNG engine or vehicle. The type approval certificate of CNG or Bio-CNG or LNG dual-fuel kit for retro fitment will be valid for three years from the date of issue and will be renewable for three years at a time. Also, the Original Equipment manufacturer or retrofitter will be responsible for meeting the safety requirements and code of practice for vehicle or engine and its kit components. The notification to amend the Central Motor Vehicles Rules, 1989 to this effect was issued after due consideration of objections and suggestions received from the public in this regard. Ministry of Road Transport and Highways had in May this year invited objections and suggestions from those likely to be affected from the amendment.